The National Science Foundation Graduate Research Fellowship is a prestigious honor. And with only 2000 fellowships awarded each year, the chances of being named a recipient are slim. Despite the odds, it was not a huge surprise when Dani Winter was named a 2018 fellow. With research experience and a work ethic that’s easy to mistake for a graduate student, Winter is a senior in her final semester at NC State in the Department of Biological and Agricultural Engineering. 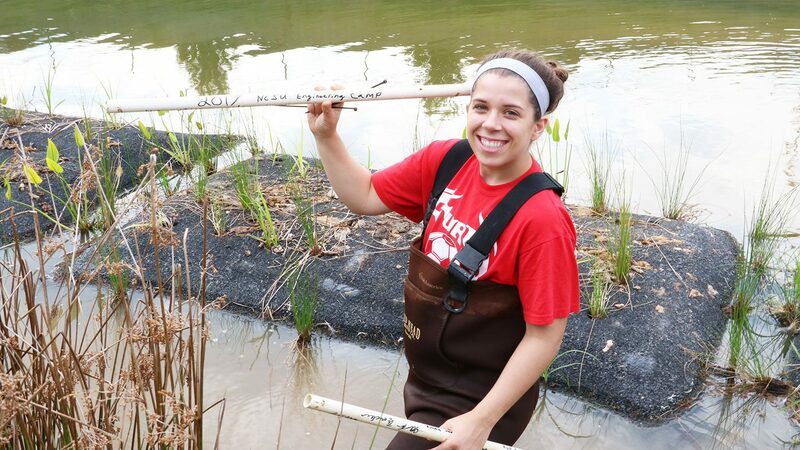 When the Park Scholar is not in the field or lab focusing on research with the Birgand Water Lab, you might be able to find her sharing her science on Twitter and interacting with other researchers. After graduation, she will continue her academic career in a doctoral program at Purdue University to prepare for a future in academia, all the while continuing the Think and Do attitude cultivated here at NC State. Why did you choose NC State? I chose NC State because I was afforded an opportunity that I could not pass up: being a Park Scholar. As a Park Scholar, I learned from local, state and national leaders; work with a non-profit organization; received forward-thinking leadership and diversity training; was mentored by Park students and alumni and leaders in my field of study; and unreservedly pursued my education and tangential opportunities without having to worry about paying for school. I chose the Park Scholarship and NC State so that I would be best equipped to become an exceptional scholar, leader and public servant. What do you study at NC State? I study Biological Engineering with a concentration in Environmental Engineering. I also have a minor in Soil Science. I am fascinated by research methods. As I freshman, I joined the Birgand Water Lab, which is led by Dr. François Birgand. We study biogeochemical process and efficacies of ecological engineering treatment systems, but with cutting-edge methods that provide exceptional temporal resolution. 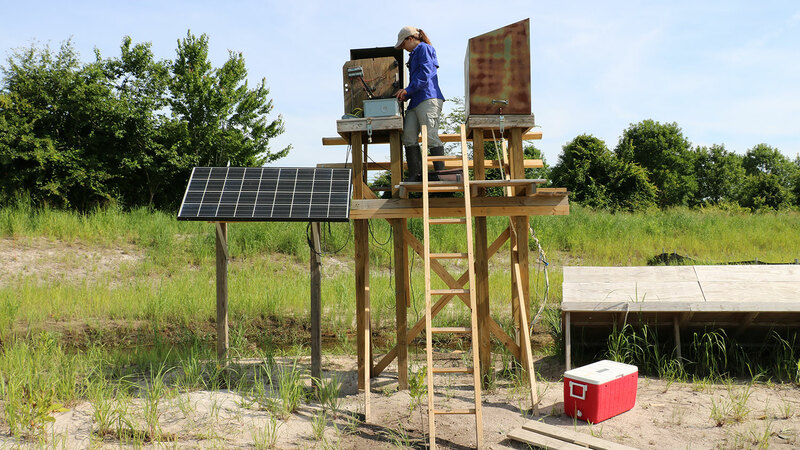 The culture of the Birgand Water Lab has led me to constantly ask how hydrologic and water quality monitoring practices can be improved and to investigate uncertainties across different methods. 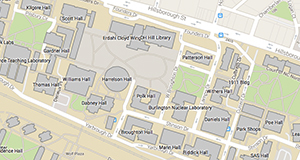 Tell us about your experience being chosen as an NSF graduate fellow. Countless people supported me in this endeavor. I developed my application around the additional research questions and stream restoration industry needs that emerged from my research experiences with a stream restoration in Goldsboro, North Carolina. My research experience with stream restorations was supported by Dr. François Birgand, Dr. Garey Fox, graduate students who I collaborated with, funding from the North Carolina Department of Transportation and the National Science Foundation, and the CALS Honors Program. Many faculty, staff and past NSF graduate fellows in my department and across the university gave me the confidence to apply, helped me develop my vision for my graduate studies, and reviewed my application. Being chosen as an NSF graduate fellow was even more rewarding because I was able to celebrate with everyone who supported me through the application process and my larger research career. What did you learn at NC State that you’ll take with you when you graduate? While at NC State, I discovered avenues to impact change through education, research and outreach. NC State imparted its land-grant mission on me. While at NC State, I discovered avenues to impact change through education, research and outreach. When I entered NC State, my understanding of research was confined to high school research papers. I had no idea of the power that applied research can have in changing lives. I began to see the power of research through observing the vibrant research culture and strong Cooperative Extension program in the Department of Biological and Agricultural Engineering through interacting with faculty through courses and mentorship. Each Park Scholar has a mentor who guides them through their time at NC State. My Park mentor is my department’s Extension Leader, Dr. Mike Burchell. His mentorship provided me with my first glimpse of the “why” behind research and Cooperative Extension. Research opportunities afforded to me by Dr. Birgand, Dr. Fox, and the CALS Honors Program and my involvement with North Carolina Water Resources Research Institute allowed me to discover the impacts that research can have and my passion for sharing and communicating science and engineering with others. I have shared my research experiences on Twitter; engaged students of all levels, faculty nationwide and regional stormwater managers; shadowed Cooperative Extension agents; conducted research in highly trafficked areas of NC State’s campus; and interacted with funding agencies and stakeholders. Rewards from integrating research discovery and knowledge transfer have inspired my desires to pursue a career path that will allow me to continue educating people about water quality and ecological engineering. After graduation, I will pursue a Ph.D. in Agricultural and Biological Engineering at Purdue University. I will work under Dr. Sara McMillan to investigate hydrodynamics and nutrient biogeochemistry in restored riverine floodplains. After graduate school, I hope to find a position as a professor and Extension specialist at land-grant university. We Grow Talent. Join us.